A suspect in the brutal beating death of a 23-year-old woman outside an Orange County nightclub was charged with murder Wednesday, as a reward grows in the hope of finding four others believed involved in the deadly brawl. Vanesa Tapia Zavala, 25, of Westminster, was charged with one felony count of murder for her alleged role in the death of Kim Pham, according to the Orange County District Attorney’s Office. An attorney for Zavala, who is a mother, said his client is "young and devastated" and that she was knocked to the ground during the melee. 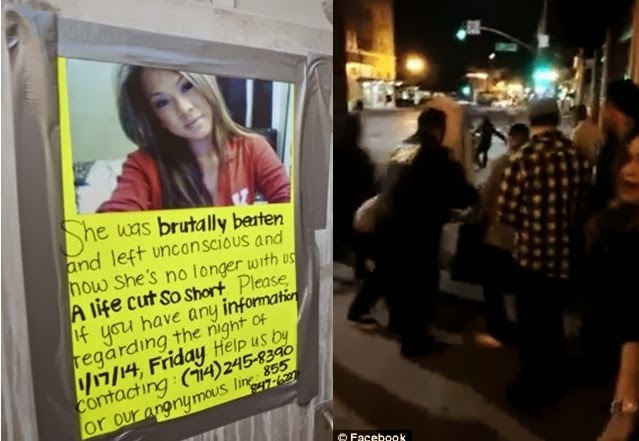 Pham, 23, of Westminster, was found unconscious on the sidewalk after a fight, during which attackers beat and kicked her as she lay on the ground outside The Crosby Bar and Nightclub just after midnight Jan. 18, according to the Santa Ana Police Department. The former Chapman University student was taken off life support and declared dead Tuesday afternoon. Friends said Pham hosted a TV show for the university. Investigators said the fight began when Pham and her friends were involved in an argument with another group of females. Two or three women hit and kicked the woman while she was on the ground, officials said. Cellphone video was taken of the beating, which shows crowds surrounding the fight, watching as it happened. Security guards staffed by The Crosby were just far enough away from the fight to not see it until it was over, police said. A woman who did not want to be identified told NBC4 on Wednesday that she saw the fight break out. "At that moment, I didn't know there was a girl in the middle of the floor being beat," she said. "There was just a crowd of people. I think she could have been saved a long time ago." The woman said bystanders watched and took videos without helping the victim. "The fight should have stopped. I don't know how long it went on for," the witness said. "It's senseless. People should pay for what they did. It's not fair." The deadly attack has prompted an increase police presence in the Santa Ana downtown district and surveillance cameras will be added in the area, the city said. If convicted, Zavala faces up to 15 years in state prison. She is being held in lieu of $1 million bail. Businesses surrounding The Crosby Bar and Nightclub raised a $5,000 reward in hopes of finding information that would lead to more arrests in the attack. At Tuesday night’s City Council meeting, Santa Ana leaders approved a matching $5,000 reward. Investigators believe there may be up to four other subjects wanted in connection with the brawl. Anyone with information is urged to call the Santa Ana Police Department at 714-245-8390 or Orange County Crime Stoppers at 1-855-TIP-OCCS.